One year after a bizarre act of local fossil vandalism on Scotland’s Dinosaur Isle let us consider the value of footprints in the sand and the implications for U.S. Government cuts to national monuments of global paleontological importance. On December 28, 2016, Police Scotland were searching for a tall male in his late 40s to early 50s thought to be driving a white camper van. A crime had been committed on the Isle of Skye, with Lochaber and Skye Police conducting a manhunt. The news conjured up images of police helicopters and roadblocks around Skye to catch the criminal. What was the heinous crime causing all the fuss? The man was thought to have been responsible for pouring plaster into some indentations on the beach by Staffin Pier on the island. On the face of it, this doesn’t sound like a very serious matter. However, the rock, or rather the dents are very special. Unique, in fact. They are the footprints of a dinosaur that walked the location approximately 165 million years ago. The An Corran dinosaur footprints are one of only a handful of dinosaur prints known from what is now the United Kingdom. They are of international importance. At the time, scientists feared that the pouring of plaster cast into the footprints had caused damage to these rare Jurassic trace fossils. On a previous trip to Skye, I met up with Dugald Ross, the keeper of The Staffin Museum, and renowned Skye fossil finder and collector. Dugald showed me the dinosaur trackway at Staffin and explained the backstory. The An Corran footprints were discovered in 2002 by a local lass while walking her dog on the beach and subsequently researched by Dugald and Dr. Neil Clark of The Hunterian Museum, University of Glasgow. The trackway provides insight into an ancient dinosaur’s biomechanics and behavior. Paleontologists can infer how animals lived and moved from their footprints. By applying the science of ichnology, the study of animal “signs”, we can piece together elements of the identity, taxonomy, and biology of the long-extinct creatures that passed this way. The dinosaur that made the tracks was a large bipedal three-toed predatory theropod, a carnivore, similar to Megalosaurus, and a relative of Tyrannosaurus rex. Sadly, but understandably, paleontologists cannot identify the species from trace fossils (footprints) alone. They need bones. Nevertheless, much can still be understood about the maker of the footprints. Like this Wiehenvenator from Jurassic Period Germany, the Skye dinosaur that made the tracks was a megalosaur that lived in a mudflat or marshy estuarine habitat. Image by Joschua Knüppe. Over 15 footprints exist on-site, and with the largest at over 53 cm (1.7 ft) in length, the trackway is home to the largest theropod footprints in Scotland. The owner of the feet, with a walking stride length of 2 m (6.6 ft), was likely in the region of 8 m (26.2 ft) long and 2.2 m (7.2 ft) tall at the hip. Most historical estimates of large megalosaur mass are somewhere around 900 kg (1984 lbs). My own calculations increase this to 3318 kg (7316 lbs), for the An Corran dinosaur, in line with contemporary large megalosaurid estimates. That is roughly equivalent to the body mass of 55 people, or two white rhino. I have worked closely with live wild white rhino and I would not want to mess with or be sat upon by one of them - never mind two. In short, the An Corran dinosaur was big. The late Professor Robert McNeill-Alexander pioneered the application of biomechanics to dinosaurs. He estimated that large bipedal theropods could walk approximately 2 to 4 m per second (5 to 9 miles or 7.9 to 14.4 km per hour), equivalent to a fast human walk or jog, and were capable of a maximum of 8 m/s (17.9 mph or 28.8 km/h). In comparison, Usain Bolt, in the 2009 World Championship 100 m final peaked at 12.4 m/s (27.8 mph or 44.7 km/h). But not everyone can run as fast as Usain, even if they were to be chased by a Megalosaur. The An Corran dinosaur was walking at a leisurely 1 m/s (2.27 mph or 3.65 km/h). It does not appear to have been in a hurry. Size comparison between Wiehenvenator (Dinosauria, Theropoda, Spinosauroidea, Megalosauridae), likely a close relative of a similar size with the An Corran dinosaur, and a human. Image by Joschua Knüppe. 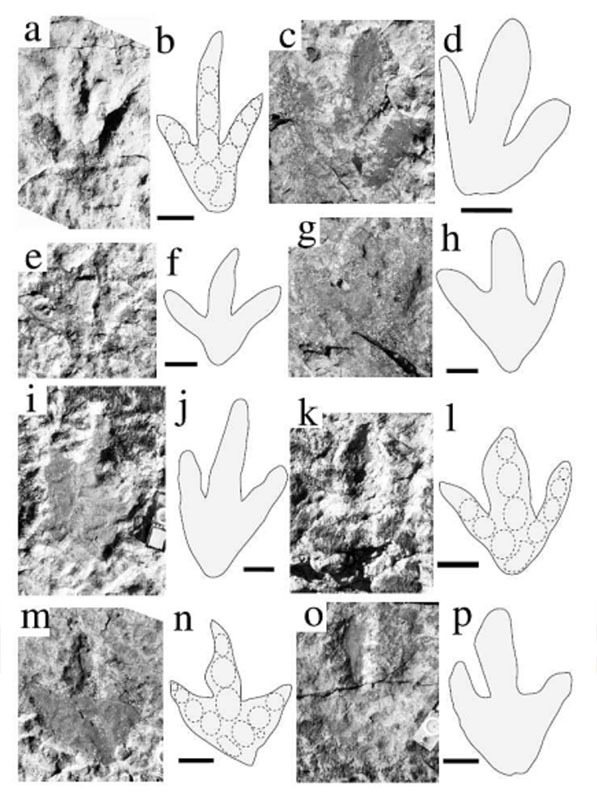 In addition to providing a perspective on the dinosaurs in life, the theropod footprints contribute to our knowledge of the diversity of dinosaurs that inhabited Skye in the Jurassic. They complement other local fossil dinosaur trackways. 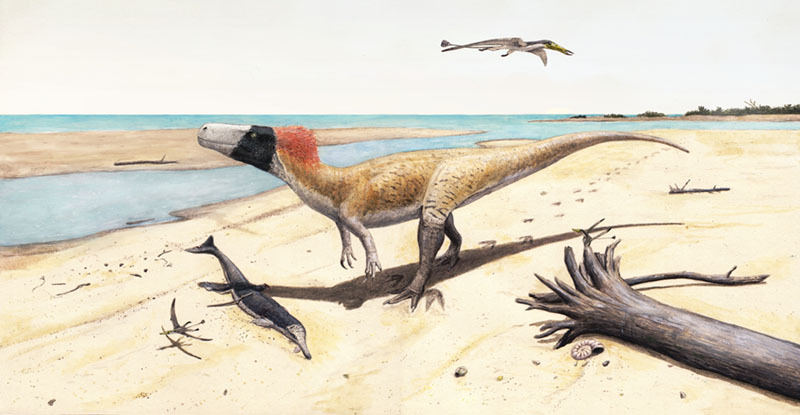 The first dino-prints, the tracks of an ornithopod dinosaur, were discovered at nearby Lealt in 1982. And in 2002, tracks of a family of dinosaurs, including the world’s smallest dinosaur footprint, were uncovered by Neil Clark at Score Bay. In 2015 hundreds of footprints were happened upon at Duntulm at the north-eastern tip of Skye, making it the largest fossil footprint site in the UK and nicknamed the “Dinosaur Disco.” They are from sauropods, giant herbivores related to Diplodocus and Brontosaurus. New fossil footprints continue to be discovered on Skye, with recent discoveries of trackways of sauropods, ornithopods, and stegosaurs, by Edinburgh University vertebrate paleontologist Dr. Steve Brusatte and his team, and PalAlba partners. Accumulating evidence from different types of fossil track has enabled paleontologist Paige de Polo to identify that different types of dinosaur used different habitats. Sauropod footprints occur in nearshore lagoonal sediments and non-sauropod prints are placed in prehistoric mudflats. As an ecologist, I find this insight into past environments and behavioral ecology fascinating. An Corran dinosaur footprints. Source: Clark, NDL, Booth P, Booth C, Ross DA (2004) Dinosaur footprints from the Duntulm Formation (Bathonian, Jurassic) of the Isle of Skye. Scottish Journal of Geology 40, 13–21. Skye is nicknamed “Scotland’s Dinosaur Isle” due to the relative abundance of fossil finds here. Dinosaur bones and tracks are not by any means abundant on Skye, but it is a hotspot of evidence of the Age of Reptiles compared to the rest of the United Kingdom. The contribution of Skye’s vertebrate fossils to global paleontology is pivotal because the finds are helping to fill in the middle Jurassic period, an otherwise fossil-light period. The mid-Jurassic is known to be a dynamic time with the diversification of several major dinosaur groups. It was also a period of radiation for amphibians, lizards and “modern” mammals. It is an exciting gap to fill. Theropod tooth from the Isle of Skye. (a) side view. (b) close up of denticles (small serrated projections). 1mm scale bars. Source: Brusatte, SL and Clark, NDL (2015) Theropod dinosaurs from the Middle Jurassic (Bajocian–Bathonian) of Skye, Scotland. Scottish Journal of Geology 51, 157-164. Skye has also contributed herbivorous dinosaur bones including cetiosaur, stegosaur, and ankylosaur, and even limited carnivorous dinosaur materials, including an isolated vertebral bone and a single theropod tooth. 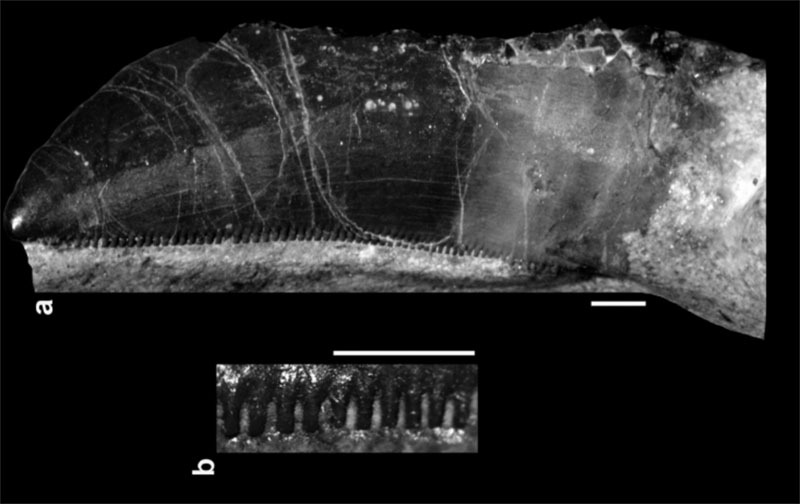 Our knowledge of the Skye vertebrate community is expanding with recent descriptions of fossil fish, ichthyosaurs, crocodylians, pterosaurs, and small mammals. In the Jurassic Period, 165 million years ago, the world was a very different place. Scotland formed part of a larger continent, Laurentia, with Canada and North America, with which it shares fossil ecosystems. Most of Skye lay beneath a shallow warm sea. 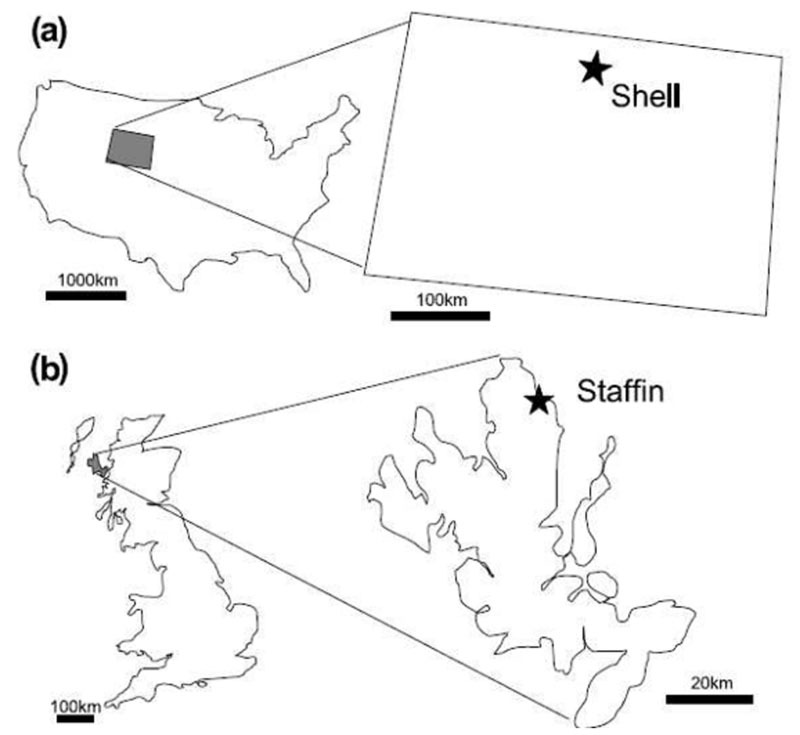 Maps showing (a) USA with Shell, Wyoming, and (b) Great Britain with Staffin, Isle of Skye. Source: Clark, NDL and Brett-Surman, MK (2008) A comparison between dinosaur footprints from the Middle Jurassic of the Isle of Skye, Scotland, UK, and Shell, Wyoming, USA. Scottish Journal of Geology 44, 139-150. At the time the dinosaur walked along what is now Staffin beach, the location was likely a marshy estuarine habitat, an ideal substrate to record the footprints of dinosaurs. The climate was Mediterranean, with Scotland lying slightly north of the equator, where the Mediterranean Sea sits today. Paleogeographic sketch map of Laurentia during the middle Jurassic, 170 million years ago. Showing locations of Shell, Wyoming and the Isle of Skye. Source: Clark, NDL and Brett-Surman, MK (2008) A comparison between dinosaur footprints from the Middle Jurassic of the Isle of Skye, Scotland, UK, and Shell, Wyoming, USA. Scottish Journal of Geology 44, 139-150. The footsteps in the sand likely dried out and then filled in with dry sand, perhaps blown by the wind, or were in-filled with wet mud. The area was subsequently compressed by overlying deposited strata and the footprints became preserved in rock. Today we find ourselves in the privileged position of being able to walk where a dinosaur walked 165 million years ago, and to be able to marvel at the footprints that it left behind. The strange case of the An Corran footprints is not the first time that Scottish fossils have been the focus of criminal vandalism. Protected sites on Skye and elsewhere in Scotland have previously been seriously damaged by someone using a crowbar, rock hammers, and rock saw. Scottish Natural Heritage, the national body responsible for the site, have a Scottish Fossil Code. If you contravene the code, you are engaging in criminal activity. It is mostly common sense. Do not remove or otherwise interfere with protected sites or potentially important fossils. For example, don’t pour plaster into dinosaur prints. Sadly, whether through ignorance, or knowing selfish disregard, fossils are damaged by people who should know better. In doing so, they deprive us of Earth’s history. While the Skye dinosaur fossil footprint vandal was never apprehended and the trail has now gone cold, the good news is that no permanent damage was caused to the dinosaur footprints. Eventually, the An Corran dinosaur footprints of the Isle of Skye will be lost due to the natural actions of erosion. Until then, they remain a national treasure and need to be treated with respect. By following and enforcing the Fossil Code, many more can enjoy the unusual experience of seeing a dinosaur trackway in situ in the United Kingdom. And walk in the footsteps of giants for generations to come. There is, I think, a lesson and message of wider geographic significance here. The international attention that the vandalism of the Skye dinosaur footprints prompted, mirrored by the response to the recent Bunurong dinosaur footprint vandalism, Australia, signifies the value in which society holds our prehistoric heritage. Links with the past are part of who we all are. This is the history of the planet upon which we are privileged to live. Geo- and paleo-conservation are vital because of the window of insight that sites provide into the past environments and life of our planet. Only by understanding the past can we effectively manage the future. Social media banner from Monuments For All. Image by Society of Vertebrate Paleontology. We live in worrying times, with the current U.S. government’s proposed cuts to large areas of the Utah National Monuments of Grand Staircase-Escalante and Bear’s Ears potentially only the first steps toward an assault on the protected areas of the USA. 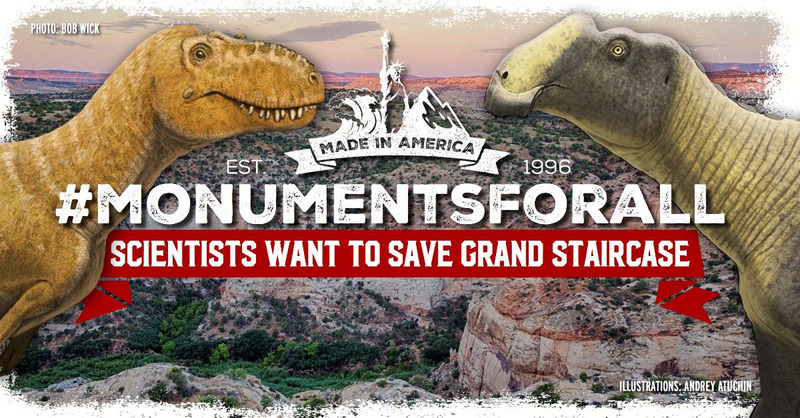 Scientifically important paleontological resources motivated the creation of both monuments. The sites are unique. They contain rare fossil environments, including petrified forests, bones, with mammals and oceanic reptiles represented, and dinosaur trackways. The motive for cutting protection is to open them to ranching, mining, shale gas extraction and consequent environmental damage or destruction. If society allows this to happen, then the act of selfish vandalism of the Skye Dinosaur Footprint Vandal pales into total insignificance. Brusatte, SL and Clark, NDL (2015) Theropod dinosaurs from the Middle Jurassic (Bajocian–Bathonian) of Skye, Scotland. Scottish Journal of Geology 51, 157-164. Clark, NDL, Booth P, Booth C, Ross DA (2004) Dinosaur footprints from the Duntulm Formation (Bathonian, Jurassic) of the Isle of Skye. Scottish Journal of Geology 40, 13–21. Clark, NDL and Brett-Surman, MK (2008) A comparison between dinosaur footprints from the Middle Jurassic of the Isle of Skye, Scotland, UK, and Shell, Wyoming, USA. Scottish Journal of Geology 44, 139-150. One of the An Corran dinosaur footprints, Staffin Bay, Skye. The coin is a British 50 pence piece of 2.5 cm (1 inch) diameter.